Manuscript indenture on parchment, with signatures and seals: 'Conveyance of Lands of Stapleton in the County of Leicester. Mr. Joseph Knight and Mr. John Edwards to The Baroness Noel Byron [Anne Isabella, Lady Noel Byron], and others'. On two skins, with the usual seals and tax stamps, and further text and signatures on the reverse of the first skin, including a witnessed receipt for £450 from Knight; also a memorandum, 2 August 1853, 'Exparte The right Honorable Anne Isabella Baroness Noel Byron Widow', 'Before me | Wm. Cowdell. | A Master Extraordinary in Chancery'. The first skin carries a plan of the property (8 acres 3 rods 33 perches), to the west of the East Shilton road to Stapleton, and of Wigstones Farm, Stapleton and Kirkby Lordship, and with the road from Barwell to Kirby going through it, coloured in green. Typed Letter Signed ('S. W. Roskill') from the naval historian Captain Stephen Wentworth Roskill to the Sandhurst lecturer Major Antony Brett-James, proposing two subjects for a lecture to the Napier Society. 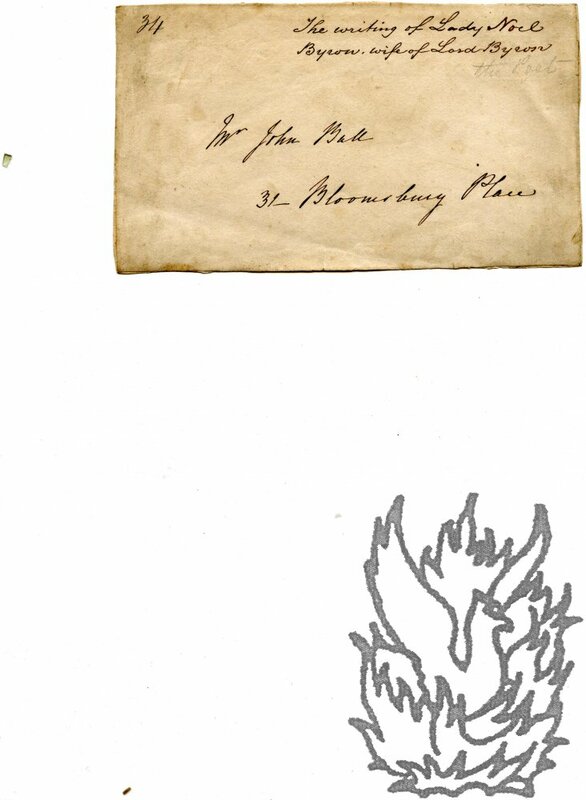 On letterhead of Blounce, South Warnsborough, Basingstoke, Hertfordshire. 12 January 1966. 1p., 4to. He is honoured to be asked to talk to the Napier Society (a military history society at Sandhurst), but is 'right in the middle of the Cambridge term', as a Fellow of Churchill College, and so must 'propose a subject which I have already talked about.' He suggests two topics: 'Trade Defence in World War II' and 'Some Reasons for Official History', in the last of which he tries 'to answer criticisms of that form of history and describe the sources I had used and the way I had worked when writing The War at Sea 1939-45'. 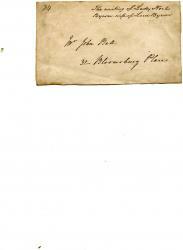 Part of letter ('Ju: Milbank') from Lord Byron's mother-in-law the Hon. Lady Judith Milbanke, requesting the recipient's support for her husband in 'the approaching Election for the County of Durham'. 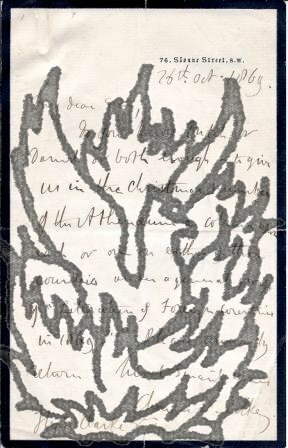 Envelope addressed in autograph by Lady Byron to John Ball. The front of the envelope (dimensions 8.5 x 14.5 cm) cut away. Previously laid down in an autograph album, and with traces of the leaf still adhering to the reverse. On aged and lightly-creased paper. In a firm, neat hand. Reads 'Mr John Ball | 31 Bloomsbury Place'. At the head, in a contemporary hand, 'The writing of Lady Noel Byron, wife of Lord Byron'. 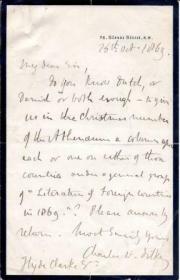 Three Autograph Letters Signed to [G. K. Menzies,] the Secretary, The Royal Society of Arts. Dilke, the 2nd Baronet (1843-1911), was a disgraced politician and author. All items 12mo and very good. All three docketed, bearing the Society's stamp, and signed 'C. Wentworth Dilke'. The first item is addressed to Menzies personally and the other two to 'The Secty.' ITEM ONE: one page. He has received the letter of 9 February and is 'pleased to send you a subscription though not much in town'. ITEM TWO: two pages. Would like to know 'whether ladies are admitted as guests and how often'. Sloane St - Sunday'; on paper with embossed crest. Signed Letter in secretarial hand to Francis B[roxholme]. G[rey]. Jenkinson[, House of Commons Clerk]. Second baronet (1843-1911), politician and author. Three pages, 12mo. In good condition although grubby and with a few stains. 'My Coal Mines Prevention of Child Labour Underground Bill grew out of the Eight Hours debate and a challenge to the Coal Owners, so I did not put metalliferous mines in, and excluded them by any title. There are very few boys under 13 in them, but the principle might be the same'. He has been consulted on the matter by the Home Office, and has spoken to Lord Grey about it.